Kathmandu is known as a great pilgrimage destination to Hindus and Buddhists from all over the world who believe that they accrue good karma (deeds ) for visiting the many holy places which hold meaning to their spiritual belief system . Although the concept of pilgrimage is a fairly new term in our culture, it nonetheless, has become an important part of making our life make sense. 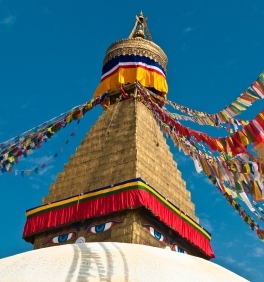 This pilgrimage in Nepal explores the many facets of “sacred”. From the valley’s temples to Himalaya caves, from meditation and prayer to religious iconography and the making of and the bear witness of ancient belief systems. Sacred Nepal is a spiritual adventure for modern times. Arrive in Kathamndu where you will be met and driven to your hotel. Tour Kathmandu proper, Durbar Marg and try to glimpse the Kumari, the virgin goddess, waving. Tour Swayambunath, an ancient religious complex atop a hill in the Kathmandu Valley west of the city proper. Swayambunath is often referred to as the Monkey Temple as there are “holy” monkeys living in many parts of the temple. The Tibetan name for the site means ‘Sublime Trees’ as there are many varieties of trees found on the hill. This site is an important place to visit for Buddhists. In the afternoon explore Pashupatinath, one of the most important temples to Lord Shiva in the world (located on the Bagmati River) and sacred to Hindus, and Boudhanath Stupa, one of the largest Buddhist stupas outside of Tibet.. See the many Tibetan monasteries and life of the community. Visit Kopan, a Tibetan meditation center. Visit the Newari Temples of Patan, a town known for its cultural heritage and religious arts, wood carvings, statue making and metalworks. Visit a local Pauba (religious iconography of Hindu or Buddhist nature or both) painter for a demonstration of this religious iconography art form and learn about the stone ground colors used and the subject matter. Return to Thamel and visit the Lotus Gallery to view more modern styles of religious art. After breakfast drive to Bhaktapur, once the capital of Nepal during the great Malla kingdom. See Bhaktapur Durbar Square with its many temples which is now a World Heritage site. Visit a mask maker and woodcut printer to see the process of their crafts. Visit Himalayan Healers for a massage and learn about its community service project. Drive outseife Kathmandu to a small village Parping and explore the sacred Guru Rinpoche Caves. The large cave is said to have his handprint imbedded in the rock. Parping is alos known for its meditation retreat centers. Depart this morning to begin your trek. Drive to Timbu (1460m). At lower Timbu begin your Walk up to the Milarepa meditation Cave (an important yogi and saint in tibetan Buddhism) (4 ½ hrs at 1620m). Tented camp will be arranged for night’s rest. Short meditation session before dinner at local meditation hall in the Milerepa Monastery. After breakfast trek to Melamchi village and Monastery (5 hrs walk – 2548m). Tour of various power places such as Padmasambhava (great Buddhist Guru) cave and the Yeshe Chogyal (his consort) cave can also be observed at the south end of the village. Walk around the village. Stay overnight at tented camp. Arrive in Neding, after 5 hrs trekking. Since ancient time, many prominent Buddhist masters, like H.E. Chhatral Rinpoche, Prince of Bhutan, have done long retreats in this area. Walk around the area, considered very holy according to various Buddhist masters. Stay overnight at tented camp. Drive to Kathmandu visitng the Vajrayogini (wrathful Tibetan consort) Temple at Sankhu en route. Check into your hotel. The day is free to shop or explore as you wish.